Republican presidential candidate reiterates his tax plan to small business owners; attacks Obama over his tax proposals. Which issue should McCain and Obama make their highest priority? NEW YORK (CNNMoney.com) -- Republican presidential candidate John McCain outlined his agenda on tax cuts to a group of small business leaders Tuesday, vowing to keep taxes low in the face of a weak economy and rising oil prices. Sen. McCain, R-Ariz., tailored much of his language to entrepreneurs in his prepared address to the National Federation of Independent Business in Washington. McCain promised to "sign into law a reform to permit the first-year expensing of new equipment and technology." He also vowed to keep capital gains taxes low "so that businesses like yours can expand and create jobs instead of just sending more of your earnings to the government." The GOP candidate also said he plans to keep the Bush administration's tax cuts from 2001 and 2003 and to reduce the corporate tax rate "from the second highest in the world to one on par with our trading partners; to keep businesses and jobs in this country." He said he would phase out the Alternative Minimum Tax to save middle-class families up to $2,000 a year and would double the size of the child tax exemption. McCain vowed to keep the estate tax low, referring to it as "one of the most unfair tax laws on the books." He criticized his campaign rival, Sen. Barack Obama, D-Ill., for wanting to increase the estate tax to a maximum rate of 55%. As for health care, McCain repeated his plans to provide individuals and families with "a large tax credit to buy their healthcare, so that their health insurance is theirs to keep even when they move or change jobs." McCain attacked "extravagant salaries and severance deals of CEOs" and said he would make sure that pay and severance for top executives was approved by shareholders. 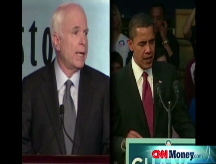 Throughout his speech, McCain lashed into Obama over tax policies. "Will we enact the single largest tax increase since the Second World War as my opponent proposes, or will we keep taxes low for families and employers?" he said. On Monday, Obama called for a $50 billion fiscal injection into the economy, which would include more rebate checks and more benefits for the unemployed. In the traditional battle over taxes, Democrats are often depicted as inclined to raise taxes, while Republicans position themselves as in favor of lowering them. Lawrence Jacobs, director of the Center for the Study of Politics and Governance, said the candidates are filling those traditional political roles in the current campaign, but with differences. "I think each will try to blur up the portrayals - Obama by emphasizing tax cuts for middle class and McCain by distancing himself from Bush and by using populist language," said Jacobs, in an e-mail to CNNMoney.com.